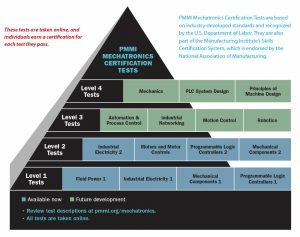 The PMMI Mechatronics Certifications are based on industry-developed standards and are recognized by the U.S. Department of Labor and the Manufacturing Institute’s Skills Certification System. Successful completion of training and certification exams of this training program articulates as 7 college credits into HCC’s Associate of Science Degree in Engineering Technology and is stackable with HCC’s Certified Production Technician program which itself articulates into 15 college credits into the same degree program with passing examination scores. All testing is proctored by Hillsborough Community College. 24 weeks in length beginning March 1 (Mandatory Orientation) – August 23, 2019. Weekly lab sessions take place every Friday, 9:00 am – 12:00 pm or 12:30 pm – 3:30 pm, (no lab sessions on March 15 and April 19, 2019). All lab sessions are mandatory and are held at Hillsborough Community College 10414 Columbus Dr. Tampa, FL. There are no make-up sessions. Course work is proctored by HCC Faculty, and completed online. Cost : $3155 (Amazon pays 95% of the cost; and the student is responsible for the remaining 5% upon enrollment). This certificate covers the function, operation, and application of common components used in fluid power circuits and systems. It also assesses the understanding of how fluid power components and accessories are placed together to create circuits and systems for powering industrial machines. The major emphasis is on pneumatics with a lesser emphasis on hydraulics and vacuum systems. Electro-fluid power troubleshooting is emphasized. Topics include: Circuits and logic, compressors and conditioners, connectors, directional control valves, electro-fluid power, filters, fittings, flow control & relief valves, gages and instruments, hoses, lubricators, metal tubing, motors, pressure sequence valves, pump and reservoir, regulators, safety, theory, threaded pipe, troubleshooting & testing, an vacuum. This certificate test is intended for entry-level mechanics, technicians and technologists who will be involved in the application, installation, modification or troubleshooting of Fluid Power systems. This certificate covers basic safety practices for voltages up to 600 volts and knowledge of voltage, current and power in AC and DC circuits, circuit analysis of series and parallel loads, and basic understanding of resistors, capacitors, and inductors. It applies these fundamentals to simple applications that would be found in residential, light commercial and simple industrial use. Candidates should be able to interpret and troubleshoot circuits used for lighting, across the line 3 phase motor starting, and simple relay logic with devices such as control transformers, fuses & circuit breakers, pushbuttons & selector switches, pilot lights & alarm devices, solenoids, 3 phase motor starters, motor overloads, limit switches, and combinations of control relays to perform basic logic functions. Candidates should be familiar with simple wiring practices for using these devices and with component level troubleshooting of these devices. A basic knowledge of industrial electricity is needed to understand the basic operation of all type of commercial and industrial equipment and to gain further knowledge of more complex packaging machines and systems. This basic knowledge of industrial electricity would be expected of an entry level electrician working in facilities maintenance or assisting in the assembly, test, startup, troubleshooting, maintenance, repair or upgrade of basic packaging machinery modules. This certificate covers the principles and applications of the most commonly found mechanical drive components as used in packaging machinery and systems. Topics include simple mechanical power transmission devices such as shafts, belts, chains, cams and gears with an emphasis on application and troubleshooting. An understanding of simple mechanical components provides the background necessary to explore more complex systems of components used on all types of packaging equipment. This certificate is aimed at entry level technicians who may be involved in the assembly, test, startup, troubleshooting, maintenance, repair or upgrade of basic packaging machinery modules.